Erica Leigh has been writing and editing professionally since 2005, contributing to a technology and education nonprofit, renewable energy companies and various websites. Leigh holds bachelor's degrees in anthropology and linguistics from the University of Washington. 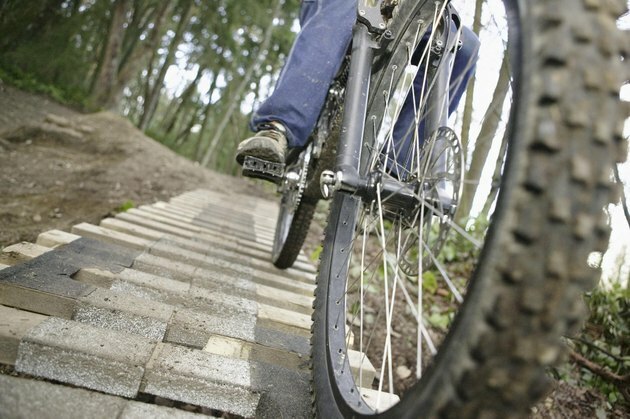 Choosing wider tires and stronger wheels helps heavier cyclists have a safer, more comfortable and enjoyable ride. Most bikes, except for high-performance racing bikes designed for thin riders, safely support riders of at least 200 pounds, and many can support riders weighing 300 pounds or more. Many bike tires have a range of acceptable inflation pressures. The heavier you are, the higher you should inflate your tires within that range. For example, many mountain bike tires take inflation pressures of around 30 to 55 pounds per square inch, or psi. If you weigh around 150 to 175 pounds, the middle of that range is fine, but if you weigh considerably more or less, pump the tires to a lower or higher pressure within the range. The same guidelines also apply to road bike tires, though the range of inflation pressures begins at a much higher number. Jan Heine, writing for Bicycle Quarterly, notes that heavier riders on narrow tires might need dangerously high inflation pressures for maximum performance. For example, 20 millimeter tires, on a bike that carries a 250-pound need 150 psi inflation. Many road tires cannot withstand this pressure. In contrast, a 28 millimeter tire can carry that same rider at about 95 psi, which is well within the acceptable inflation range for many tires of that width. However, you can't use a 28 millimeter tire if it's too wide for your wheel, such as certain road bike frames. Check your wheel size and bike manual for sizing guidelines before buying new tires. Your bicycle's rear wheel carries more of your weight, so inflate it to a slightly higher pressure than the front tire. It might seem counterintuitive, but always put your highest quality or newest tire on the front wheel. If your rear tire blows out, it's easier to stop your bike safely than if your front tire blows out, because you steer with the front wheel. Choose wheels that are the correct width for your tires. The fashion in mountain bikes is to use rims much thinner than the tires they carry, but these won't support heavy riders. Use bike wheels with at least 36 spokes; some riders even seek out tandem bicycle wheels that have 40 to 48 spokes for additional strength. Lower spoke counts, such as 24 or 32 per wheel, mean that when one spoke breaks or weakens, the other spokes have to carry an even higher load relative to the spokes on a 36-spoke wheel. How Much Air Should Be Put in a Bicycle Tires?